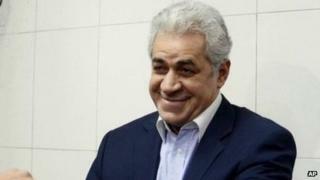 Egyptian politician Hamdeen Sabahi has officially submitted his candidacy in forthcoming presidential elections. Mr Sabahi, a left-winger who came third in the previous poll in 2012, is so far the only challenger to former army chief Abdel Fattah al-Sisi - who last month announced that he was standing. Gen Sisi led the overthrow of Islamist President Mohammed Morsi last July after mass opposition protests. Correspondents say he is likely to win the presidency, given his popularity. Mr Sabahi submitted the required documents to the election committee after gathering 31,100 signatures, his campaign said on Saturday. The required number of signatures is 25,000. Gen Sisi presented his documents last week after gathering 200,000. Nominations close on Sunday. So far, there are no other candidates. The first round of the presidential election has been set for 26-27 May. If no candidate wins more than 50% in the first round, a second will be held in June. If Mr Sisi does become president, he will be the latest in a line of Egyptian rulers drawn from the military, going back to the 1950s - a line only briefly broken during President Morsi's year in office. Human rights groups say the military-backed authorities have displayed increasing hostility to independent media and to political opponents. Since Mr Morsi's overthrow more than 1,000 people have been killed and thousands of members of Mr Morsi's Muslim Brotherhood been detained by the interim authorities, who have designated the Islamist movement a terrorist group.